Over the last couple of months or so – this poster has been popping up in various places around Worcester Park. It first caught my attention outside Green Lane School at the beginning of July where I was expecting it to be advertising one of the many summer fetes and festivals that were happening at the time. So I was a little taken back to find that it was a September beer festival, being advertised outside a school, and that the boy scouts were running it. 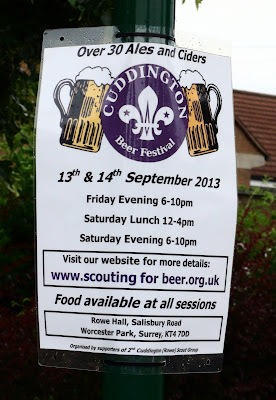 However it seems it is actually being run by the (many) adult volunteers in order to raise money for the 2nd Cuddington Scout Group which (apparently) with over 150 members is one of the largest and most active in Surrey. It all kicks off on Friday 13th September but the organizers are stressing it is important to buy tickets in advance. These tickets are £5 for an evening or £10 to avoid the queue and also get two free pints thrown in. Their website goes into much more detail but you can pick up tickets from Centrals Bar & Lounge in Central Road and B Radford Family Butcher in Stoneleigh Broadway in addition to all the normal electronical forms of ticket buying. The actual event is being held at their Scouting (and now drinking) headquarters: Rowe Hall, Salisbury Road, Worcester Park, Surrey, KT4 7DD. Guess What – Road Works!